At the end of February I promised that this month we'd take a look at older cats, and what to look out for as your cat ages. My lovely boy Bandit is now eleven or twelve (we're not sure of his exact age, as he came from a Rescue and before that was a stray) and although he's still got a lot of life left in him, he's noticeably started to slow down recently. So age has been much on my mind. As in humans, age affects every part of the cat's body. The heart and lungs, other major organs like the kidneys and liver, glands (in particular the thyroid and pancreas) the immune system, muscles, bones, teeth, sight and hearing all become less efficient as a cat ages. So it's helpful to know what to look out for and expect as your cat enters its senior years. How is a cat affected by age? Immunity: an older cat's immune system starts to slow down, making it more prone to infection and reducing the ability to fight disease. Keeping your cat's vaccinations up to date is important, as is a once- or twice-yearly health check by your vet. Heart and lungs: these major organs start to become less efficient, making circulation and breathing problems more likely. Cats may develop irregular heartbeats and have difficulty keeping warm, and there's an increased likelihood of respiratory infections. Kidneys and liver: the function of the kidneys and liver is to filter and detoxify the blood. 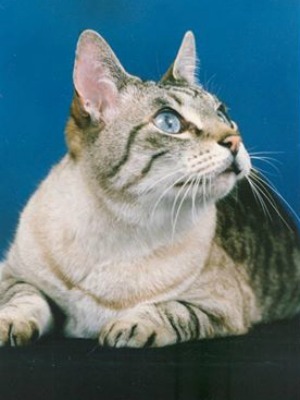 The likelihood of kidney disease (renal failure) increases with age and seems to be a particular problem for Siamese cats so this is definitely one to watch out for. An excellent website, run by Helen Fitzsimons and named after one of her cats, is Tanya's Comprehensive Guide to Feline Chronic Kidney Disease - which will tell you all you need to know and more about kidney disease in cats. Thyroid and pancreas: The thyroid gland produces hormones that control all sorts of processes including heart rate, digestion, muscle control, brain development and bone maintenance. An under-functioning thyroid will slow down all these processes; an over-functioning thyroid will speed them up. Neither is good and both are more common in older cats. Diabetes (malfunctioning of the pancreas) is also more common in older cats. Symptoms of both included unexplained weight loss or weight gain, which should be investigated, as should increased thirst and drinking and peeing more often. If your cat is affected by diabetes another excellent website for information is Your Diabetic Cat, from vet Elizabeth Hodgkins. Joints and muscles: muscles tend to shrivel and weaken as a cat ages, and joints become prone to arthritis, making it harder for your cat to move with ease and especially to jump. If your cat's feeding bowl or bed is on a high ledge or shelf, you may need to place it somewhere lower or put a stool or chair nearby for easier access. Eyesight and hearing: both vision and hearing deteriorate as cats get older and this can result in your cat getting startled easily and becoming more aggressive if they don't hear or see you coming. An annual or preferably six-monthly check by a vet will go a long way towards identifying and coming up with treatment plans for everything above, so do make sure you schedule a regular check-up for your cat. As I was in the middle of writing this month's newsletter I was amused to come across a BBC article about a cats' retirement home. The Lincolnshire Trust for Cats (in Lincolnshire, UK) provides a lifetime home for cats whose owners have died. Many cats in this situation are elderly themselves and difficult to re-home due to their age. This very unusual retirement home, attached to a more conventional Rescue, provides a comfortable, happy home where elderly cats can live out the rest of their lives in peace. ... I thought you might enjoy this video from interior design website Houzz. As you'll see, a number of the cats are Siamese or Siamese mixes, and all the cats clearly enjoy their unusual and beautiful cat-friendly home. Now if only I had a spare $50,000 ... ! Last month I wrote about toys and had a few follow-up emails and thoughts. Glenn, whose cat Nicci was Meezer of the Month in May last year recommended leaving a radio on as cats seem to like the company, and I've read of other people who leave their TVs on for their cats. Cats do seem to enjoy having some sort of low background noise for company, so you might like to consider it if you're out all day. And Janet, whose cat Lexi was a Meezer of the Month in 2013 told me that Lexi brings all her 'ribbon' toys up to bed with her and lines them all up neatly in a row! 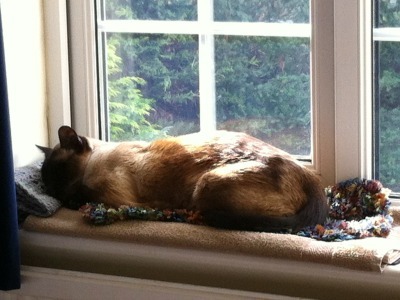 Our Meezer of the Month for March is Buddy, described by his owner Lauren as her 'guardian angel'. Named after Lauren's grandfather, Buddy was found abandoned with his three kitten siblings behind a Coca-Cola machine on a college campus. Now a thriving young adult, Buddy has brought joy and laughter to Lauren's life and makes friends with everyone he meets. Read Lauren and Buddy's full story here. 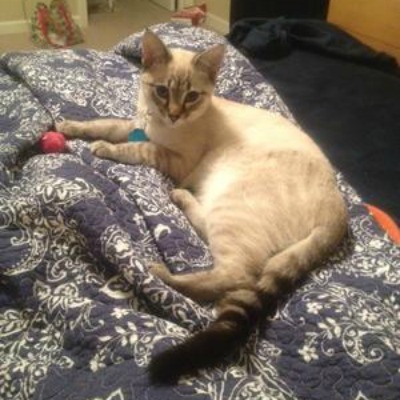 One of our Facebook regulars, Darlene, posted a photo recently of her first-ever cat, Mowzer, a lynx point Siamese cross. Mowzer was rescued as a tiny kitten (so small he could fit in the palm of Darlene's hand) from a back alley on a very cold spring day. He was a devoted family companion and had a good long life, surviving till the ripe old age of 21. I've always heard that Siamese cats could live to a good age, and some of them well into their 20s, so I asked our Facebook readers how old their oldest Siamese cat had been. I still have to go through and collate all the replies but will give an update on this in April. In a short newsletter like this I can't, of course, hope to cover all there is to know about caring for older cats. If you'd like to know more about the issues mentioned, you may find the following books useful to have by your side. The first of these is Complete Care for Your Aging Cat by Amy Shojai, which, as its name suggests, is a comprehensive book covering all you need to know about older cat care. Your Cat: Simple New Secrets to a Longer, Stronger Life by vet Elizabeth Hodgkins, the owner of the website on feline diabetes. Wishing you and your Meezers, however old they may be, a very happy April. We'll be back towards the end of it to talk about Cats Who Chew!